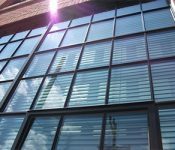 There are common deficiencies that plague older commercial windows, due simply to the technology that was available when they were manufactured. They simply were not built to the same standard as today’s windows, resulting in premature aging and damage. As such, it may be necessary to replace commercial windows more often. Some of the issues that plague older windows include degradation of putty that holds the glass in the window frame, leaking air and water, and unwanted transfer of cold or heat. Overall, older windows are not energy efficient, due to their monolithic, or single sheet glass, construction. 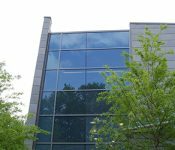 Given that these are common issues, how can we tell when it’s time to replace – rather than refurbish – commercial windows? The key factors in making this determination are energy efficiency and window performance. If existing windows are not efficient or thermally broken, if the glass is thin or ineffective, or if old weather seals are compromised or missing, it may be time for replacement. In addition, if hazardous elements are present or if the existing windows are beyond repair, replacement will be necessary. 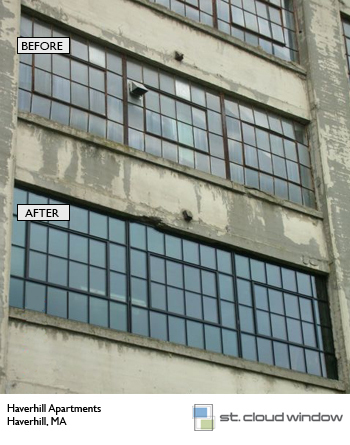 Restoration of existing windows is an option in many rehabilitation projects. This generally involves refurbishing and re-glazing the existing windows. However, this is not always the most practical long-term solution. Refurbishing only marginally improves the glass and does nothing for the frame. Most older frames are not thermally broken, and will continue to negatively impact the building’s heating and cooling costs. Further, most frames can’t accommodate one-inch insulating glass, which results in unattractive exterior sightlines as the actual muntin sightline will almost double the dimension. Overall, the restoration process is generally more expensive than replacement. A more labor-intensive process will increase labor costs. Hazardous material abatement for lead, asbestos and other materials will drive the cost up as well. A quality historic window replacement should be a near-exact replica of the original window. It should also incorporate modern technology to meet today’s performance standards. We will discuss the challenges and strategies of historic window replacement in our next blog post. St. Cloud Window manufactures the finest custom-made aluminum window and door products for new building construction, commercial window replacement, historic window replacement and projects where high-performance acoustic attenuation sets the standard. To learn more, view our full product line or contact us to request a quote and get started.